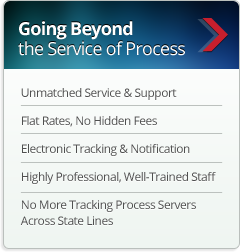 How Does a True Nationwide Process Serving Company Operate? … serving locally with a robust nationwide presence … that’s how! At Writ Legal, this is our reality! We routinely handle dozens of services on a daily basis around the country regardless of the location or urgency. We understand how difficult it is to find a full-service process serving company who is able to serve locally, nationally, and still meet your standards. We can say that because we are virtually everywhere! Large network of local process servers: While our competitors forward your service of process to other companies, we personally handle your service of process. We are not a forwarding agency or a process serving directory. We have a network of over 1,600 professionally screened process servers who will get your job done! Option to use more than one process server on any given service: Due to our large network of process servers, in most cases, we have the option of using more than one process server to work your services. This approach increases the probability of successfully serving your documents in a timelier manner; especially when dealing with an evasive individual. Use of the latest technology: Through the use of a portable device and our unique online tracking system, we stay connected with our servers and clients to ensure they receive the latest status updates! The fastest routine turnaround time NATIONWIDE: We attempt service in 7 days or less anywhere nationwide on all routine services! Flat rate pricing: No more special rate memorization, fuel fee, per-attempt fee, hourly fee, or notary fee. You do not even have to call to get a rate. With our flat rate system, you will know exactly how much and what you are paying for — every single time! Unmatched Customer Support: We have a fully staffed office available from 5:00 am – 8:00 pm PST dedicated to providing our clients with updates, answering their questions, and presenting them with solutions. We even provide after-hours support; making us further accessible to you. Full-Service Process Serving Company: When you work with a company who is capable and efficient, everything gets done that much faster and smoother. We will file your documents, serve them, and file your completed proof of service — it’s as easy as 1, 2, 3! Volume service specials: Our discounted packages are specifically tailored to high volume clients that include foreclosure firms, insurance companies, financial institutions, and government agencies among many others. Our professional office staff and process servers will not only serve your volume exactly per your specifications, but will also keep up with the critical updates, affidavit filings, and more. Now that you are familiar with our lawgistics, let us handle your next service of process! We’ve got you covered from coast to coast — from Seattle, Washington, to Miami, Florida, and everywhere in between. Our process servers are ready to serve for you! Get Started Today. For immediate assistance please feel free to call our office at 1.888.667.2038.